Welcome to the November issue of Essentially England News! I hope you're all safe and well. On our side of the world, it's heading towards winter. The clocks have changed back - thank Goodness! - it's cooler and darker out.... and it's definitely the time to head back into the kitchen to experiment. If you've followed Essentially England for a while, you probably know I love finding and digging through old cookery books. For dishes I wouldn't have thought to cook, or for things that have evolved over the many years they've been made. And right now, there's a stack of some real beauties sitting on the corner of my desk, courtesy of my husband's late aunt. I can now salivate over such delicious concoctions as Boozy Steak Pie, Granny Loaf, or Lemon Fluff. And with the season of festive family gatherings and sumptuous feasts just around the corner, I thought I'd make this a bit of a foodie newsletter. And no, after finding that wonderful stash of cookery books and recipe notes, I will not bemoan the scandalous shortage of sloes this year. Instead, I'll be sipping mead or (shock, horror!) Tennessee Honey while I write - and the world is not ending. I like spending Saturday afternoons in the kitchen at this time of year. The laptop usually sits on the kitchen table, there's music, and a glass of red...and I tend to get some writing done while whatever I'm making bakes or bubbles away. It's unlike the big family feasts like Thanksgiving, Harvest Festival, or Christmas, where each family has their own traditional dishes - some of which only come out of hiding once a year. Saturday afternoons in my kitchen are for experimenting, for looking through cookery books and wondering what might work and what will not, and for today, I would like to share three recipes that have caught my eye. One's a kitchen staple, one's a main course, and one's a pudding. They're all variations of traditional dishes, but variations I've not seen, cooked or eaten before. The flavour of the season is undoubtedly cinnamon. And I'm a big fan of apples. So this recipe is right up my street, even when I'm not really into syrups. I have an ulterior motive for making this, but more of that later. 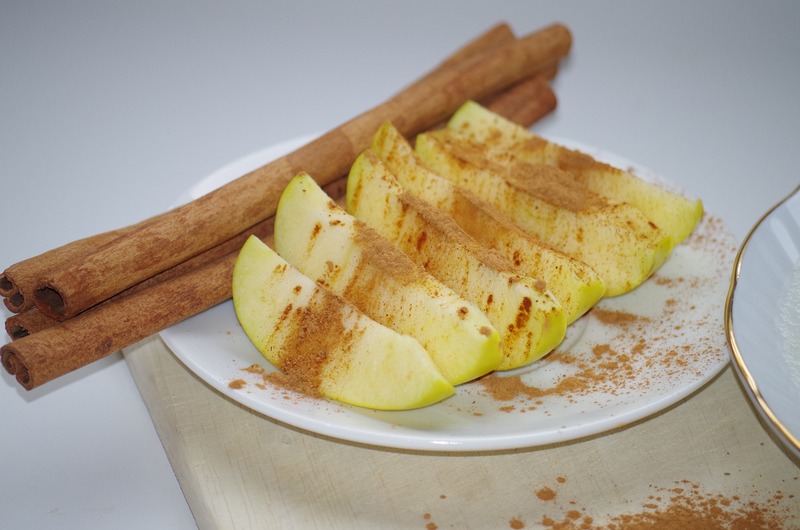 You'll need apples, butter, cinnamon, sugar, water, and more cinnamon. Melt 2 tablespoons of butter in a saucepan. Add about 6 tablespoons / 1/3 cup of water and 100g / 4oz / 1/2 cup of sugar. I've made it with dark brown, but just because I had some. I'm sure ordinary caster sugar will work just fine. Heat gently and stir until the sugar is dissolved. Add a teaspoon of cinnamon, more if you're like me, then mix a teaspoon of corn starch with a little water until smooth and add to the sugar, butter and cinnamon mix. Keep cooking until thick, which won't take long at all. 2-3 minutes on a medium heat. Add three dessert apples, cored and cubed, and more cinnamon. Cook gently until the apples are soft and coated in a thick, oozing, cinnamon syrup. I can see this steak pie sit perfectly alongside a plate of hot, salty, rustling chips. For me, steak pies stand and fall with the quality of the gravy oozing out when you cut into them. Which is why this recipe caught my eye. Because here, the gravy is made with brown ale, and I can almost taste that as I write. It's also what I would call a bottomless pie, ie. 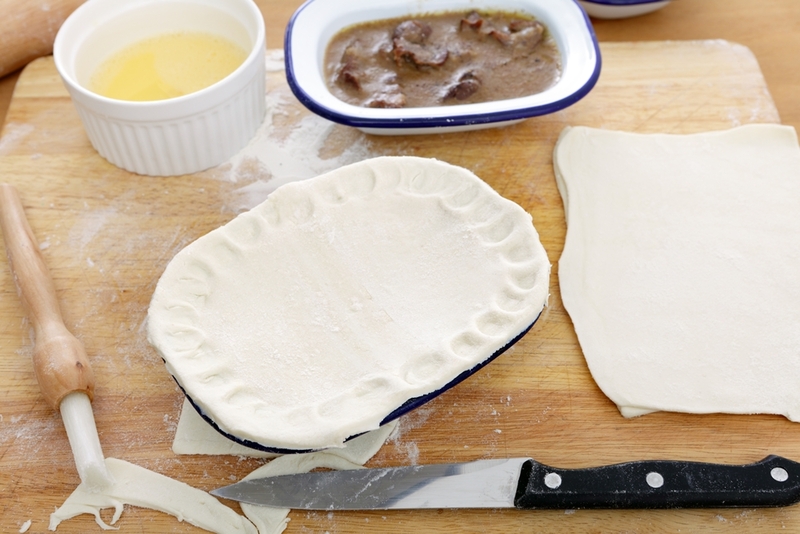 the meat and gravy are just covered by a pastry lid, rather than surrounded by pastry on all sides. In my opinion, that makes it a perfect dish for a family dinner or for sharing food with friends. Season the flour with salt and pepper and mix into the cubed steak. Place the meat into a large saucepan with the onion, garlic, ale, and thyme. Bring to the boil, stirring occasionally. Then reduce the heat and simmer until the meat is tender, 1 1/2 hours - 2 hours maybe. When the meat is cooked, add the mushrooms and spoon the filling into the pie dish. Add enough gravy to fill the pie dish halfway, and leave to cool. Meanwhile roll out the pastry, a little larger than the pie dish. Cover the dish with the pastry, seal the edge, and decorate the top if you like. Brush the pastry with milk or egg wash, cut an opening into the top, and bake for about 20 mins until golden brown. Then reduce the oven's heat to 180°C / 350°F / Gas Mark 4 and cook for a further 25 minutes. We would serve this with green peas and either mashed potatoes or freshly cooked chips. Even writing it, without pulling open the oven door to smell what's cooking, this sounds wonderful. I hope you think so, too. I will need to report back on my chosen pudding next month. It's called a Lemon Fluff and I found in a booklet called Waddow's Best Recipes. I'm not sure yet if this is in any way connected to Waddow Hall in Lancashire... but the pudding seems to be a "make it up as you go" recipe, which assumes we all know how to cook. For the adventurous ones: cream 1 1/2 oz of butter with 3 oz of sugar and 4 egg yolks. Add rind and juice of 2 lemons. Stir in 1 1/2 oz self-raising flour and 1/2 pint of milk. Beat egg whites until stiff and fold in. Then pour mixture into a form, stand in a dish of 1 inch of hot water and bake gently for one hour. As you can see, the instructions could do with a tad more detail, but I'm liking the idea of something light, fluffy, and lemony following a supper of pie and chips! Next month we're firmly into Christmas territory. Along with some fab food, I'm thinking of hunting up a few traditional gifts for the England lovers amongst us... and maybe a look at an odd tradition or two.